"Weakness is man's final invitation for which God unendingly waits." Booklet 3 of 6 in the Loving God series. 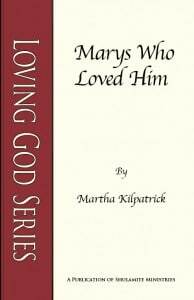 In this booklet, Martha looks intimately into the lives of three Marys who understood that faith involved loving a Person, not a doctrine, and not a ministry to man. Who are the Marys who loved Him? In the final analysis, your life will rise or fall on this issue: who did you choose to love and who did you love the most? That is the only issue. The Marys in scripture stand for loving Christ—and their love surpassed that of even the disciples, before Pentecost. “Mary found favor with God. How do you find favor with God? By being good? By not losing your temper? No, I think you find favor with God when you love Him. He looks for love. Mary said, ‘Behold…the bondslave of the Lord’ (Luke 1:38). “You see, a bondslave is one who says, ‘Anything, Lord. Anything You say, Lord. Be it done to me according to Thy word.’ Well, we know the end of Mary’s story. It is all glory. In Marys Who Loved Him, Martha looks intimately into the lives of three Marys: the mother of Jesus, Mary Magdalene, and Mary of Bethany. These women understood that faith involves loving a Person—not a doctrine, and not a ministry to man. Marys Who Loved Him is now available in both print and digital format. I have studied Marys in the Bible in some depth and it is interesting to me that it is the Marys who loved the Lord. There is a reason why every one of them was named Mary. Maybe He is trying to tell us that there is a complete picture in all the lives of the Marys? Also, the woman in scripture doesn’t just stand for the female… The woman stands for the subjective experience of God—the emotional, involved, experiential encounter with God. So these women represent not just what a female can have, but what the Christian experience is to be. An angel came to Zechariah and he said, “You are going to have a child” (Luke 1:11-18, paraphrased). “I am Gabriel, who stands in the presence of God… And behold, you shall be silent and unable to speak until the day when these things take place, because you did not believe my words” (v. 19-20). “And behold, you will conceive in your womb and bear a son, and you shall name Him Jesus” (v. 28-31). Then Mary asked a question, the same way that Zechariah did. She said: “How can this be since I am a virgin?” (v. 34). However, there must have been something different in the spirit of her question, because the angel gave her a straightforward answer. There are questions of challenge and doubt, and then there are questions of clarification. Mary must have asked for clarification. You see, when you love God, you belong to Him. And if you don’t love Him, you will never belong to Him. “Behold, the bondslave of the Lord; may it be done to me according to your word” (v. 38). Simple words… You see, you will only surrender to what you love, and if you don’t love…you won’t surrender. There is another Mary who loved Him: Mary Magdalene. Mary Magdalene was a woman out of whom seven devils were cast. Other than that, we know little about her. We don’t know whether she was really the woman who anointed Christ’s feet with her tears, but she appears on the scene right after that event which took place in the city of Nain. I studied it chronologically to place it in relation to the city of Magdala. I didn’t find anything conclusive. It remains obscure. But the message of her life is not obscure. We know that she knew Christ and He had a ministry in her life. And we also know, because the scripture tells us, that she was one of the women who followed Him and ministered to Him. hers was exposed as large. Then on the first day of the week, John 20 says that Mary Magdalene came early to the tomb. Similar passages in the other gospels name the other women. But only John mentions Mary Magdalene specifically. She went to the tomb to anoint the body and she found that He wasn’t in the tomb. So she ran back to the disciples and told them about it. They ran to look at the tomb and then they ran back. Peter and John ran to see the empty tomb and when they saw it, they ran back to the other disciples. But Mary Magdalene did not run away. She stayed. You see, Mary’s love surpassed that of other followers. Your actions will give away your love. Mary had no home but where He was. She had no desire to be anywhere that He wasn’t. And while they came and looked and ran away, she wasn’t about to leave until she found Him. The one you love, you will follow. You will hold onto the one you love. So Mary Magdalene was standing outside the tomb weeping. As she wept, she stooped and looked into the tomb. She could not bear to be separated from Christ. Mary didn’t necessarily believe in the resurrection. She believed that He was dead, but she loved Christ so much that she would rather be with His dead body wherever that was. She didn’t yet comprehend that He was alive. You and I know that. We know the significance of it, but what were her thoughts? Mary thought someone had stolen His body and she was going nowhere until she found that body—and it was just a dead body, so far as she knew! She loved Him in life. She loved Him dead. And wherever He was, she would be… Mary had no home but where He was. Martha, who was trying to please mankind, was alone and had no influence and no lasting significance except to show the contrast to Mary. Your influence is in exact proportion to your love for Christ. Your power does not lie in your power of persuasion, to get others to believe in Him. No, your influence lies in being salt—that which makes others thirsty to know Him as you do. And while they probably didn’t understand Mary, didn’t approve of her, they stayed wherever she was, because wherever she was there was light. The scripture says that the Jews stayed with Mary in the house and when Mary left, they left! You see, Martha wanted to show the world how dedicated and hard working she was, but Mary showed the world…Christ. When Martha showed the world how dedicated she was, the world was bored and uninterested. But when Mary showed the world her Christ, they were captured by her Christ. You see, your influence will happen as you fellowship with Him, as you come from His presence and live out of His presence. Christ faced His crucifixion as a man. The only one who heard Him and believed Him and understood Him was Mary, and she spared nothing to give Him her support and understanding. The Lord Jesus had a need? How astounding?! He had a need and only the one who loved Him…knew it. You see, we consider ministry to be feeding the poor. That is the ultimate ministry that we understand. No, no. Christ exalts this as the ultimate ministry. It is a ministry of adoration and worship. The ministry of finding out what God needs and being the instrument He uses to give it. I am aware that God needs your love for Him. He has sent me to tell you that He wants your love. Mary spilled a year’s wages just to minister to Him. Judas sold Him for thirty pieces of silver. Judas moved, betrayed, sold…exactly following this anointing. And it is interesting he did this, because 2 Corinthians says that your fragrance will change the world that you walk through. Those who have chosen death will go more towards death because of you. Those who have chosen life will go closer to life because of you. If you worship Him, it is impossible for the world to remain the same around you. Those around you will either come closer to Him or go further away from Him. You will be a dividing line in the world, in every place you walk. The power you possess to influence the world lies in your adoration of Christ. And you will only enter that adoration through a simple decision.